Schokland and Surroundings have symbolic value for the unrivalled struggle the people of the Netherlands have waged against water. Its history starts in prehistoric times, as part of the mainland. From around 1000 AD fishermen and farmers started to occupy this area to make a living. In the following centuries the water rose and rose, until Schokland finally ended up as an island. This was at the end of the Middle Ages. Fishing and shipping became the main source of income for the Schoklanders. Living on the island wasn't to last forever: in 1859 the inhabitants were ordered to leave. Life had become too dangerous due to the ever rising sealevel. In 1941 the surrounding area (called Noordoostpolder) was drained to create more agricultural land to feed the Dutch (and German) people. Schokland became part of the mainland again. Amidst the endless potato fields of Flevoland, the former island of Schokland stands out. 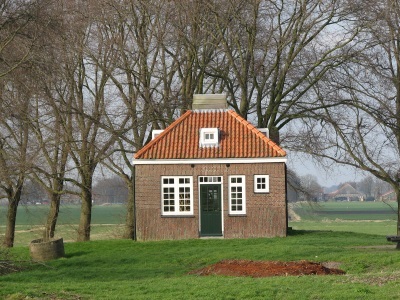 The village of Middelbuurt is a "terp": a mound in the flat landscape. On Middelbuurt, what used to be the main village of Schokland, a few houses and a charming church are left. Nobody lives here anymore though. I visited the Schokland Museum on Middelbuurt. A good place to dive into the history of this place. There are also short walks in the area, that let you come up close with the somewhat desolate landscape. During my second visit I was blessed to be in the company of a knowledgeable guide, which really helps to get a feeling for the place. This time we also visited the remains of the former village of Emmeloord, which was located on the other side of the island from where the museum is. Both sites are now divided by a road and some contemporary agricultural landscape. If you've got a car, it's easy enough to get here, but it's a little out of the way by public transport and took me a far while to arrive - including working for at least 40 minutes from the bus stop. Aside from that, this is an interesting site but there isn't a lot to see of value. There are a few ruins and evidence of the land structures here, but the main reason for listing - the use by humans over so many years - you have to get from the information boards. I visited this WHS in April 2013. The small museum at Mittelburt does not offer a great deal of information but the video helps to get an idea of the importance of Schokland. The surrounding 'terps' that can be reached by walking in the polders are quite rewarding on a Spring sunny day not least for the Flevoland birdlife. 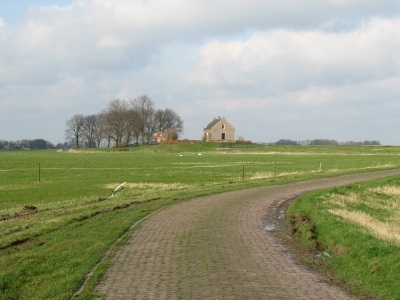 To reach Schokland by bus involves walking from the nearest bus stop in the village of Ens. Buses arrive in Ens from Zwolle via Kampen, a picturesque riverside town with a railway station. Buses continue from Ens to Emmeloord (the new one) where I changed for Lemmer and the DF Woudegemaal. I hadn’t expected too much from Schokland (or rather I had expected that it would be a shock), but in reality when we visited it during our tour of the Netherlands we found it to be quite a pleasant place. 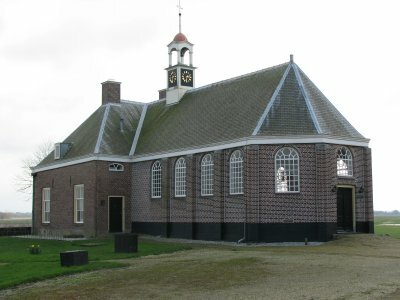 We arrived there at 10.30 a.m. from the road that passes in the middle of the former island, parked at the museum parking and realised that the Middelburt village is opened only from 11 a.m. (a typically too short Dutch opening time - it closes at 5 p.m.). Even if great part of this village is visible from outside (in particular from the southern side, where the imposing stone and wooden dykes built against the sea are located), as it is really incredibly small, we decided to visit it later in the morning to better appreciate the history of Schokland. So we decided to have a stroll around the island to see the other terps. It is really a pleasant walk, even if in the space that separates the terps there is really nothing to see - just fields and fields wherever you look. The first interesting feature one notes is the difference of level (about one meter I think) between the island and the surrounding landscape, that once was the sea bottom and that was subsequently drained as part of the Noordoostpolder in 1942, when Schokland ceased to be an island and became in this infinite flat agricultural territory a sort of hill, that is however situated three metres below the normal sea level. Then you realise that the path on which you are walking is covered by thousands of shells, as if you were on a sea beach. Finally we arrived to the terp Zuidert, that, as Middelburt, appears from the distance just as a hill, “a hill on the hill”. On the top of this there is nothing else remaining from the village than a water well and a small wooden building (it is not clear if it is original or reconstructed, as it is not for many other structures on Schokland). Much more interesting is the terp Zuidpunt: here you can see only one structure, but this quite impressed me as it is strange to see such a big and old building in comparison with the others, that date mainly to the 18th and19th centuries, on Schokland. It is a big Gothic church (with tower) of the 14th century, of which only the imposing foundations remain. It is interesting to note that there is a sort of “church in church”, the foundations of an earlier building situated inside its perimeter. Near the church, below the terp, on the southernmost point on the island, you can see the interesting foundations of a lighthouse, which is just a small circle. Instead of all that walking you can also arrive by car to this place on a road running outside the island and park there but in this way you won’t be able to see Zuidert. Then we returned in a freezing wind to Middelburt and entered the village. This consist only of some small lovely coloured wooden houses disposed in a semicircle around a relatively big brick reformed church with a nice sober interior situated on the top of the hill and some foundations of what seem to be cisterns. In the houses is situated the Schokland Museum, that quite enlightened me about the history of the island. It contains archaeological and paleontological finds from the island and the dried bottom of the sea, photos, models and reconstructions of the former appearance of the island. In particular I understood why also the surroundings of Schokland are inscribed on the WHL. This area was once part of the island, that was much bigger and in the Middle Ages was even a peninsula linked to the mainland, but it was eroded by the sea so much that finally in 1859 the inhabitants were evacuated; on the former medieval dry land were found many dykes and foundations of terps, as well as prehistoric settlements, that however are invisible for the common visitor. Finally we decided to arrive by car to the last terp, Oud Emmeloord, on a road that flanks externally the island and crosses it in its northern part. It is certainly the biggest and most important terp and the hill appears even from a great distance. Here, protected by wooden dykes, stands the lighthouse with its brick keeper’s house and an another wooden buildings. Impressive is the former port, quite big and well protected by dykes, with wooden pillars at its entrance. There is still some water here that recreates the original appearance of the port, which is typically Dutch, but much more desolated than the today’s lively mainland ports. Our visit was far from being disappointing, however I think that it was exaggerated to include Schokland on the WHL. It is a symbol of the Dutch struggle against the sea but here it is the sea to have dominated the situation, with the men just building villages to be protected against it. There are much better symbols of the struggle against the sea on the List, such as the Woudagemaal and the mills of Kinderdijk, which are great technical achievements where the action of man is much more noteworthy and where it is the man who controls the water. It should be noted that it couldn’t be inscribed preferably as a good example of a landscape of terps because there are much more important and preserved terps in the northern Netherlands and Germany. The terp is one of the few features in the landscape, from a distance it just looks like a clump of trees. I wasn’t really expecting a large site but the size still surprised me it is very small. We turned up at about 9.20 am and the village/museum does not open until 11 am. The kind lady that was sweeping up let us have a look in the gift shop (the UNESCO plaque and certificate is here) and a quick peek through at the museum. After that we had a walk around the terp and in the surrounding fields, from the back you can see it sitting up from the landscape a little more. From behind you could look into the museum a little more and it is very small there are only about 7 or 8 buildings of which the church is the most prominent. After about 20 minutes we were back at the car, feeding a goat that had its head stuck in a fence, as we had a full schedule for the day we didn’t wait for the museum to open. There are very few (none?) public transport links here, but it is well sign posted from the A6 motorway, it is about an hour drive from Amsterdam and about 25 minutes to the Ir D.F. Wouda Steam Pumping Station. All in all this has to be the most underwhelming visit I have had to a World Heritage site, admittedly I didn’t get to see the museum which may have added to the experience, but the prospect of a small folk museum won’t be enough to drag me back here anytime soon. Driving by Schokland you don't see a significant thing, but when you stop and take some time to look around, it actually is quite an interesting place. We visited the small museum which had some good information about the island of Schokland through the years: the first people who lived there, the problems with water which eventually led to evacuation of the island and the poldering of the land around the island. The small church on the island is still intact and there's a photo exhibit inside, which can be quite funny if you look at them up close (geez, those people on the island were not supermodels!). A walk around the former island is nice too, you can still see where the edge of the island is and there are still some remainders of buildings. Hard to imagine that it was an island once, adjacent to the open sea.Now, thru extensive diking and land reclamation costing billions of dollars, a part of newly acquired land wrested from the North Sea by eminent Dutch civil engineering. At one time human bones would float by from the graveyard during heavy storms.Now it is a protected part of the mainland creating a new 12th Province when there were 11 only before 1950. Land reminescent of the past when it was an island of Dutch fishermen families. I was born on Schokland and lived there for many years.It is a beautiful and still quiet part of the Netherlands.You can still good see how the former island has formed. You can make nice walkings and bicycle tour round the former island.In the museum the history is exposed.Have a look !! 1.5: Martina Ruckova Daniel Chazad Svein Heltberg Peter A. How Schokland came to be as it is? 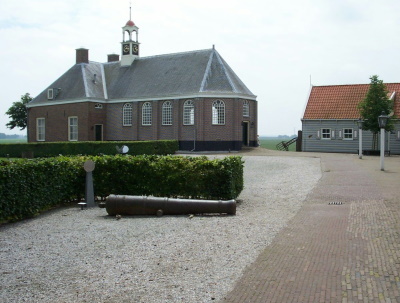 Former Islands: Schokland is a former island in the Dutch Zuiderzee. Schokland lost its status as an island when the Noordoostpolder was reclaimed from the sea in 1942. 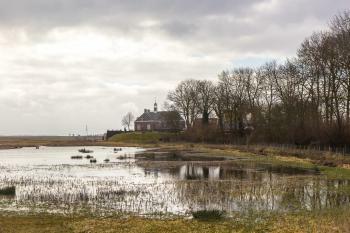 Polders: Schokland lost its status as an island when the Noordoostpolder was reclaimed from the sea in 1942.